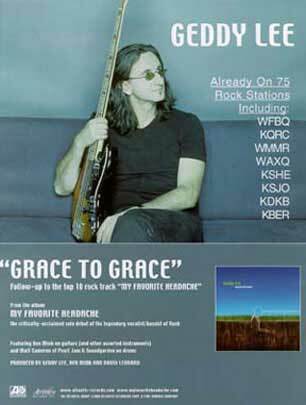 "Grace To Grace," the closing track from Geddy Lee's solo album, "My Favorite Headache," is a surprising choice as the set's second single. Although it has vibrant rock guitar licks, a strong composition, and Lee's less-is-more approach to playing keyboards (which all make for a great tune), it doesn't leap to mind as the most radio-ready cut from the set. But considering Lee's membership in Rush-a band where going against the grain has always been par for the course--we should expect the unexpected, since it's one of the cornerstones of their success. This song should have little trouble being accepted at classic and modern rock formats, although it might have difficulty fitting in with the current crop of songs dominating the mainstream airwaves. "Grace" is also reminiscent of the Rush standard "Time Stand Still," which explains why it has the feel of already being a classic rock song even though it's brand-new. Nice to hear one of the most respected figures in modern rock continue to write songs that defy today's musicby-numbers landscape.